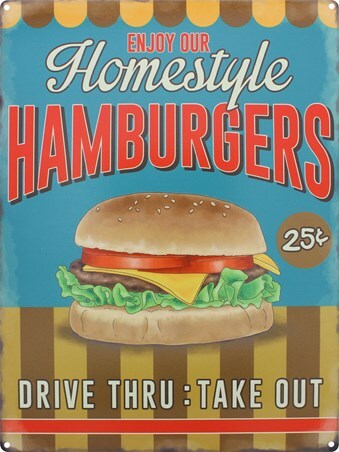 "Enjoy our homestyle hamburgers!" For those of you out there who's idea of home cooking involves going to a drive through and buying a take-away meal then celebrate your laziness and love of food with this retro tin sign. It is sure to keep your passion alive, and your belly rumbling, until you next manage to get your hands on a burger. The vintage design is produced through it's bold use of colours and inclusion of many different styles upon a heavy background. It is visually stimulating and will look fantastic once hung up. 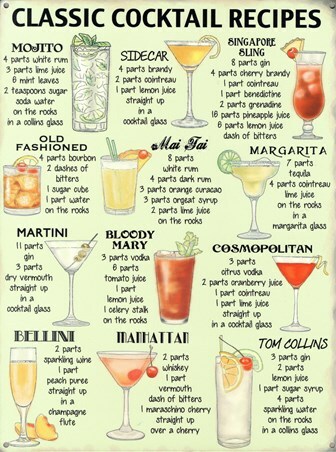 Consider yourself a lover of cocktails? If so, this awesome tin sign featuring recipes for twelve of the best cocktails around is a must have! Including recipes for the Mojito, Sidecar, Bloody Mary, Old Fashioned, Cosmopolitan and Tom Collins, you will be making perfect cocktails time after time! So equip your home with every cocktail maker's best friend and hang this brightly coloured and eye-catching tin sign in your home. 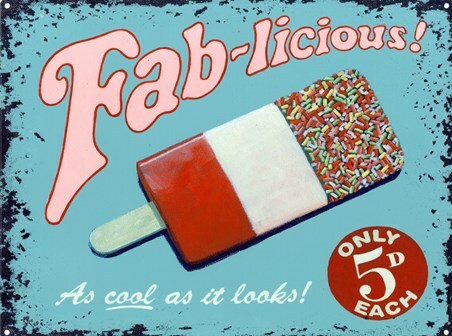 Make sure you are feeling fab all year round with this awesome tin sign which features a classic Fab ice cream. 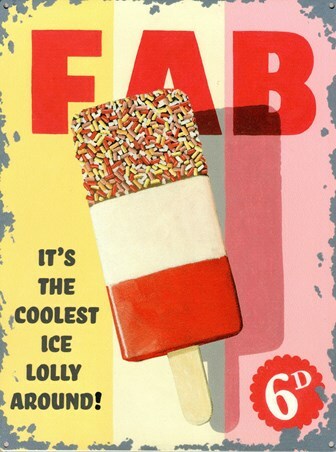 Known as the nation's best selling lolly, the Fab was introduced in 1967 and was aimed at girls aged 5 - 15. Using the iconic Thunderbirds "F.A.B" phrase as inspiration and selling the lolly with Thunderbirds gifts, this delicious iced treat with chocolate and sprinkles is the perfect gift for cool kids. In a distressed style, this vintage advertising tin sign will brighten up any room in your home. 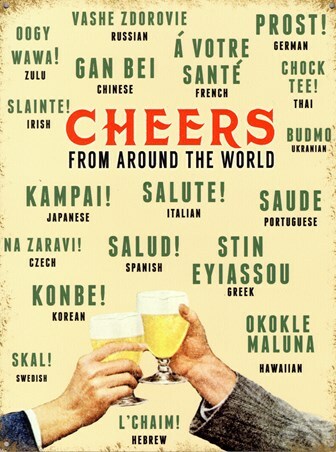 If you are planning a trip abroad and want to impress the locals, this vintage looking tin sign featuring the many different expressions used to say 'cheers' around the world is just what you need! From the Spanish 'Salud!' to the French 'Á votre santé', you will always appear cultured when drinking on holiday thanks to this fantastic sign. It is also the perfect accessory if you are looking to add vintage charm and an exotic touch to your home! Roll up! Roll up! Come and get these deliciously plump and juicy hot dogs that are the best in town. This vintage tin sign is a feast for the eyes. The eye-catching background of the orange stripes in the background against the light blue diamond makes it appear as though it is jumping out at you and that you could lean forward and take the hot dog straight out of the sign. 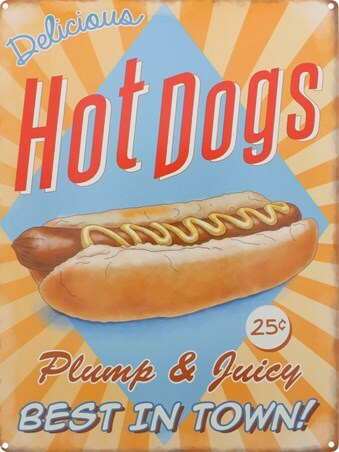 Whether you love hot dogs, or are a fan of the old-fashioned retro advertising, this is a great addition to your kitchen at home. This comical sign is great for all those wine lovers out there! Is there such a thing as drinking too much wine? Well the lady in this sign doesn't believe there is! Decanting wine from bottles and a box slows her drinking progress down, hence she has come up with the ideal solution: stick a little straw on the side. Genius! Saves on time and not to mention the washing up. 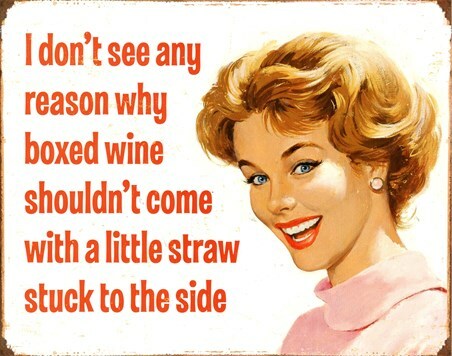 Also the "little straw" makes it very lady-like and civilised so there's no need to worry about your image. Originating in Switzerland in the late 18th century, this highly alcoholic spirit was incredibly popular in Europe amongst artists and writers alike. Vincent Van Gogh, Oscar Wilde and Pablo Picasso were a few of many known to enjoy this particular tipple. It is commonly referred to in historic literature as 'La Fée Verte' (the green fairy) due to the hallucinogenic effects caused by drinking the beverage. 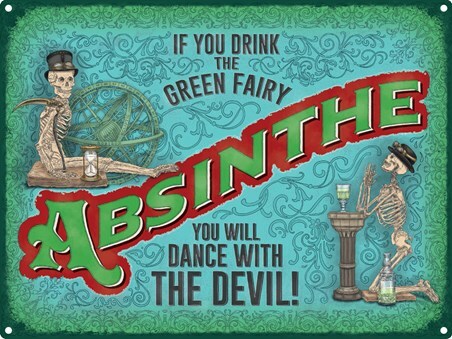 This tin sign features the caption 'Absinthe, If You Drink The Green Fairy You Will Dance With The Devil!' pictured on a patterned blue and green background with 2 haunting, skeletal figures either side. Adorn your walls with this colourful design, but remember, you have been warned! 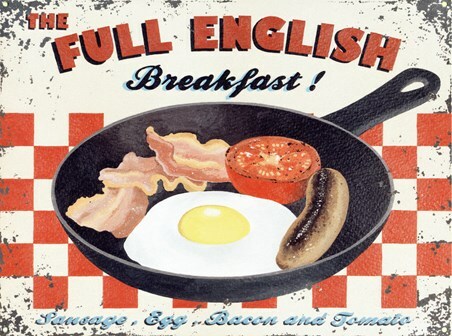 If when you get up in the morning you can think of nothing better than tucking into a hearty full English breakfast, this vintage inspired tin sign featuring just that will get your mouth watering! A frying pan full of the must have ingredients for an English Breakfast is pictured against a red and white checkered background, creating a wonderfully retro charm that will look great on any wall. 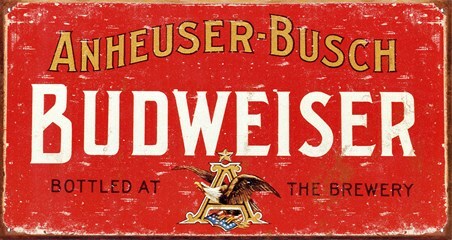 Discover the beauty of Budweiser with this brilliant tin sign which features a vintage style advertising image. This weathered style sign shows the old Budweiser lettering with the American brewing company 'Anheuser Busch' along the top. Across the bottom, the company logo floats on the wings of a magnificent eagle, ensuring that this tin sign suits the homes of drinking connoisseurs and learners alike. A classic image used by Cadbury to promote it's chocolate. Founded by John Cadbury in 1824 the company has established itself as one of the leading confectionery companies in the world. 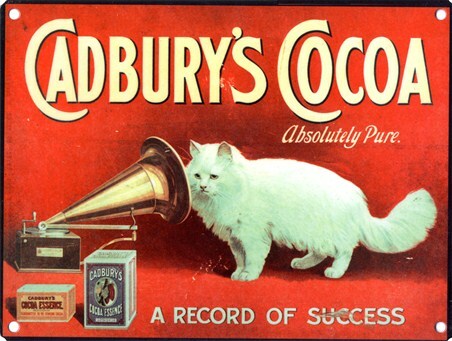 This ad shows an adorable white cat, set against a red backdrop, looking into a gramophone, symbolising the purity of the cocoa and the company's record of success. Whether you love chocolate, cats, or vintage advertisements this is the type of tin sign that will appeal to anyone and it will look great in any room. This lolly is fab-licious - and it will only set you back a mere five pence! This confectionery snack was launched in 1967 by the manufacturer J. Lyons & Co. Ltd. This retro advertisement really is "as cool as it looks". The use of pastel colours is aesthetically pleasing and the ice lolly is a feast on the eyes. If you are feeling nostalgic and would love nothing more than to get your hands on this tasty treat, then this sign is sure to add some vintage charm to your home. If you are looking for a bit of a boost in the morning then why not treat yourself to this vibrant, vintage tin sign. 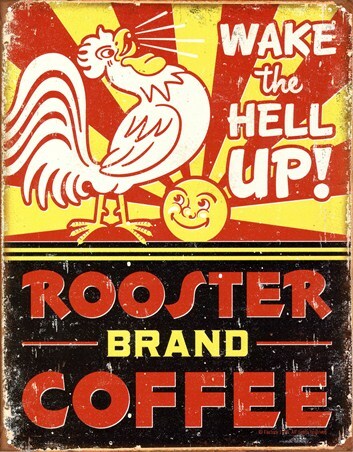 Ensuring that you are wide awake and ready to face the day, a rooster clucks as the bright yellow sun rises in the sky in this advert for Rooster Brand Coffee which is guaranteed to help you "wake the hell up!". So whether you love a fresh coffee first thing in the morning or as a pick me up in the afternoon, this tin sign is sure to keep you alert as you go through the day. 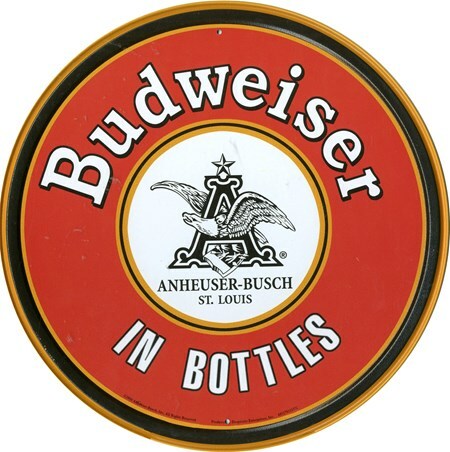 If you're a fan of Budweiser beer then this retro tin sign is a great addition to your home, or a great gift for a friend. This sign will get you dreaming of your favourite beer. It has comforted you when you were in need, consoled you, brought you fun and happiness, relaxed you at the end of a long day and quenched your thirst. The least you can do is hang this sign to pay your respect to the King of all Beers! 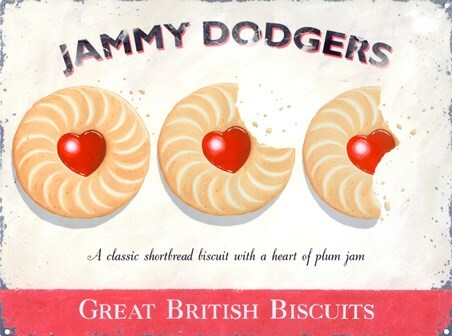 Everyone loves Jammy Dodgers! This "classic shortbread biscuit with a heart of plum jam" is utterly irresistible. With it's gooey centre and crumbly butter biscuit, these have been a much-loved British classic for years! This vintage tin sign depicts three images of a Jammy Dodger, as they progress to the right, more and more bites have greedily been munched. If you're boiling the kettle as we speak and pulling out the biscuit tin, then this is the perfect addition for your home. If you sometimes feel that your kitchen is more of a cafe with requests for food at all hours of the day then this humorous tin sign will let your feelings be known. In primary colours of red and blue and with a distressed, vintage feel this eye-catching sign would make the perfect gift for any put-upon Mum or Dad. Whatever the magnitude of your crisis, this brilliant tin sign will ensure that the waves of unsettle are quelled in no time at all. 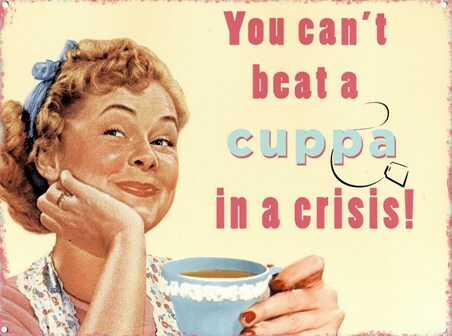 Passed down from generation to generation, it is common knowledge that you can't beat a cuppa in a crisis. Sitting with her brew in hand and a beaming smile on her face, this retro woman looks seriously chilled out as she forgets all about the baffling issue that was clouding her mind only a brew ago. Who could resist this tempting range of delicious afternoon delights!? With afternoon teas now becoming more of a luxury than a tradition, the poor cupcake and baked goods alike are becoming forgotten about! So why not bring back the spirit of having a cup of tea and cutting into a Victoria Sponge in the afternoon by hanging this tin sign on your wall. This strawberry, chocolate and vanilla cupcake artwork shows the little cakes decorated with sprinkles, flakes and incredibly creamy icing. And look at that big cake on the top of the tier! 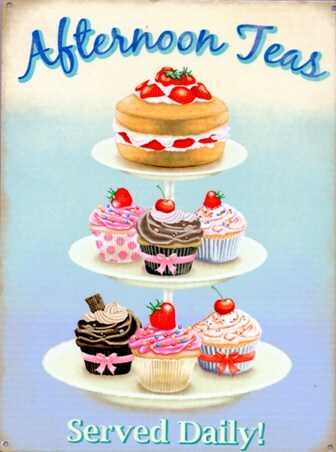 With beautiful pastel shades and a classic vintage feel, this tin sign is an inspiration for a cake filled afternoon. Perfect for any kitchen or cafe. This delicious malted drink has been around for over 100 years and is jam packed full of nutritional goodness! Ovaltine is a creamy malty drink which is not only delicious but it is a healthy option too. This classic drink can be consumed hot or cold and was originally advertised as a soothing before bedtime treat. 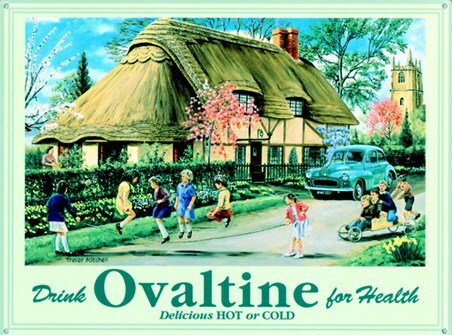 So if you are a fan of this yummy beverage, then why not hang this delightful tin sign on your wall and enjoy the beautiful artwork of Trevor Mitchell with this traditional English country village scene of children happily playing after having their Ovaltine goodness! If cooking is your way to relax and unwind and your kitchen is your haven then why not spice it up a little with this wonderful art tin sign. 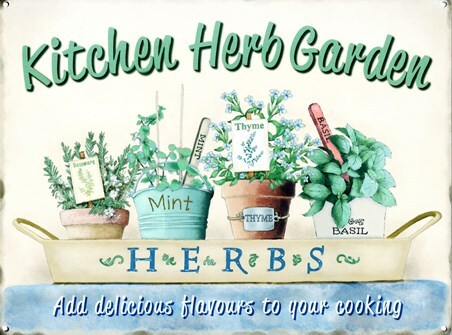 With 'Kitchen Herb Garden' in green across the top and a pretty beige herb tray in the centre, it is bursting with some of the best loved herbs including rosemary, basil, thyme and mint. So whether you are looking for some flavoursome inspiration for your next meal or just a charming piece of art work for your wall, this homely tin sign is sure to complement your kitchen perfectly. 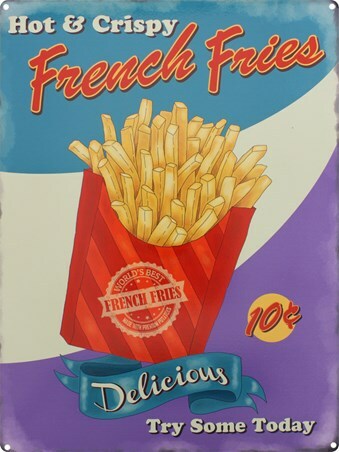 Bring a little vintage advertising to your kitchen with this fantastic tin sign. Featuring a delicious hot dog smothered in ketchup and mustard, this image is sure to get your mouth watering. With a light blue background, this tasty treat really grabs your attention and originally, you could get your very own sausage in a roll for as little as 15 cents! 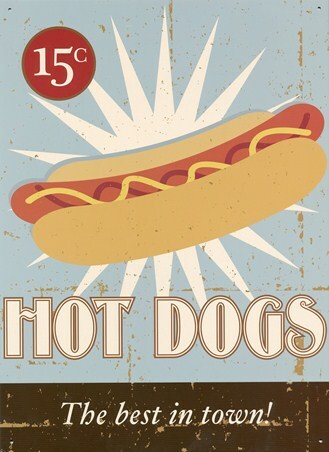 So if your family love having real American hot dogs for lunch, or even if you own a diner or cafe, then how about hanging this rusty style vintage style tin sign on your wall and let everybody know that the hot dogs you serve are 'The best in town'! 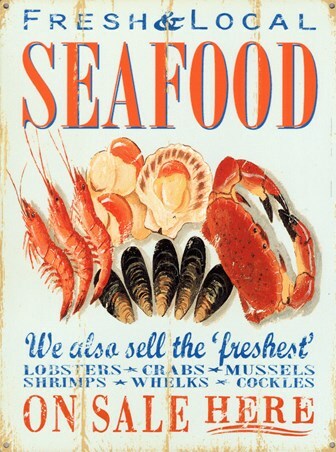 If you have a penchant for fresh seafood, this tin sign featuring a colourful array of lobsters, crabs, cockles, mussels whelks and shrimps will get your tastebuds tingling! A rusted effect gives a vintage charm to this cute sign filled with coastal colours, sure to give you the impression of being by the seaside everyday! Service please! 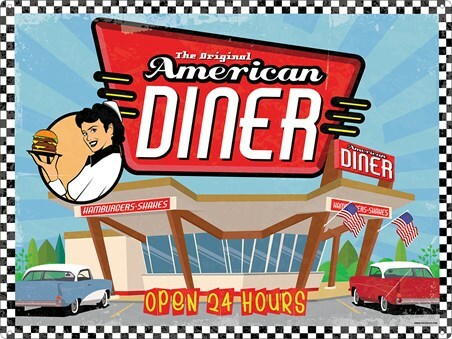 Enjoy your burger and fries in classic 50’s American style 24 hours a day! Like all good diners, the interior is essential for that authentic experience, and this tin sign ticks all the boxes! With a black and white chequered border that frames the main diner, the scene is completed with a smiley waitress holding a juicy looking hamburger and two vintage cars in the parking-lot. 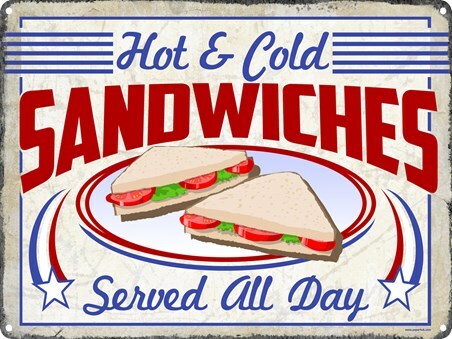 Add some retro charm to your kitchen, and create your own experience with this awesome tin sign! If you're a big dairy fan and have never opened your fridge without seeing a fresh bottle of milk stored inside, then this vintage style tin sign will look great hung in your kitchen. 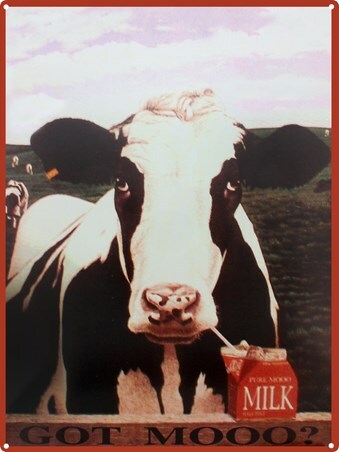 Set on the background of an open field, a large cow can be seen staring blankly at the camera, as he sips on a carton of 'pure mooo milk' through a straw. Written on the fence he's leaning on is the hilarious caption 'Got Mooo?'. It will make a great gift for anyone looking to add a touch of animal humour to their home. Going to watch a film at the cinema just isn't the same without sharing some popcorn. How else can you enjoy the film, or throw bits of popcorn at people who are being loud? When popcorn is served hot and buttered it is utterly delicious. 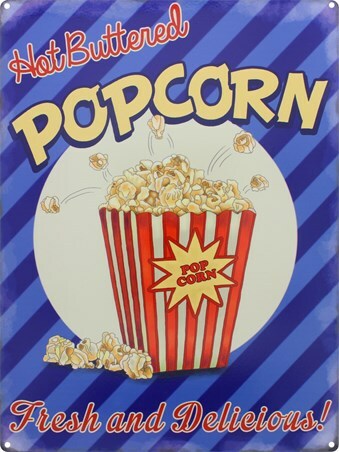 Whether you love going to the cinema, or just cannot get enough of this tasty treat - this fantastic tin sign is perfect for you. It's vintage design is bold, creative and eye-catching. So display it proudly at home and incorporate some colour to your room with this awesome sign.